It's the final day of the Cascais Trophy and the weather pattern that has been established over the last few days is set to continue as Quantum Racing seek to retain their overall regatta lead in the 52 Series. Regatta wins are always important along the way but they are the bonus. One thing is clear with the compact, tight fleet is that it won't be easy to build a big margin. Recall how Emirates Team New Zealand left Cascais last year with a 20 points lead. That size of margin will of course be much harder to achieve. 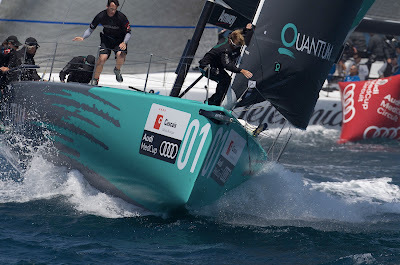 Quantum Racing have notched up four races from seven starts including yesterday’s coastal race and hit the water today with a lead of 5.5 points over Audi Azzurra Sailing Team and Container. The predicted forecast id for another day of stiff Portuguese tradewinds sailing with up to 21 knots in the afternoon, and the NW’ly has already been prominent this morning. Wind speeds are expected be between 8 and 17 knots around 1300hrs from between 330 and 350 degs, start time, building as time goes on. And, as usual, on the final day of each Audi MedCup regatta, no start sequence can begin after 15:30hrs.